Romulus, Michigan is located in the EDT (Eastern Daylight Time) time zone, UTC/GMT -4. The sunrise is at 07:39 and the sunset at 19:02 for the moment of the mid-October2018. The length of the day is 11 hours 23 minutes. The time in Greenwich, London is 5 hours ahead of Romulus, Michigan. Detroit, as well as the southwest area of Michigan, is located in the field of a humid continental climate. That is also affected by the Great Lakes, the series of the freshwater lakes located in the upper mid-east region of North America. A humid continental climate is usually described as the one with the significant temperature differences. Therefore, the summer in that area is too hot, while the winter time is cold. 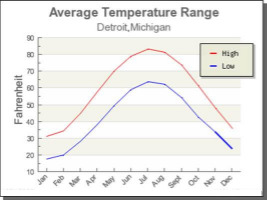 Winters in Detroit are cold, the temperature is rising above the freezing only 44 days annually, while, dropping below -18 °C only 4.4 days per year. Summers there are quite hot, the temperature is rising above 32 °C about 18 days annually. As the climate area, the city is located in is characterized by the broad temperature ranges, the temperature is about −3.6 °C or 25.6 °F in January and 23.1 °C or 73.6 °F in July. 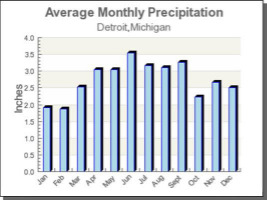 Meanwhile, the warmest season of the year lasts from May to September in Detroit. The freezing window usually continues from October 20 until April 20. The highest temperature ever recorded was filed on July 24, 1934, when the temperature reached 41 °C or 105 °F. Notably, the lowest temperature was recorded on January 21, 1984, when the temperature reached -29 °C or -21 °F. The precipitation frequently happens in the period between May and June; the rainfall level might reach about 850 millimeters annually. However, specific changes in precipitation level took place over time; thus, the rainfall level reached a mark of 520 millimeters in 1963 and 1.212 millimeters in 2011. Snowfall happens in the period between November 15 and April 4; however, it was sometimes noted during October and even May. The average snowfall level is about 108 centimeters per season; yet, it had reached its minimum of 29 centimeters in 1881-82 and a maximum of 241 centimeters in 2013-14. During spring and summer, there are frequent thunderstorms taking place in Detroit. Detroit, unlike other cities in Michigan, is not as affected by the lake-effect snow. The winds coming from the Great Lakes much likely bring rains rather than snow.